The Beni Add caves are located in the mountains southeast of Tlemcen, about 20km from the city. 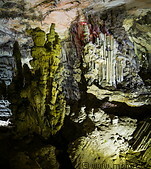 The caves are at an altitude of 1000m. There is a large parking for the cars, from which visitors reach the caves after walking past souvenir stalls. From the gate a staircase leads into the caves up to a depth of 57m. Visitors walk along a paved trail with railings for about 700m into the mountain. 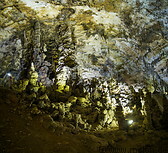 The cave complex is huge, consisting of several interconnected chambers, full of stalagmites, stalactites and other rock formations. 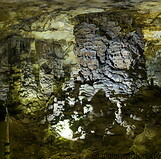 The cave interior is illuminated with lamps in different colours. The caves can be easily reached by car (30 minutes) from Tlemcen. There is no accomodation at the caves. Visitors usually stay in Tlemcen.